Use 360° objects to get more attention! These days almost anything can be purchased online and the competition for the customer has become tougher. Before placing an order customers want to see products from all angles - even online. The more realistic a product appears to be online the quicker customers will develop trust. They will stay longer on the webpage and the chances for a successful sale increase. 360° turntable objects are the ideal medium for a product presentation. The customer gets a three dimensional idea of the product and can freely decide which details he or she wants to look at more closely. Looking at products becomes a 3D experience with impressive turntable product photos! 360 Webspin makes sure that using fascinating turntable photos doesn't become an arduous experience for you. Thanks to a simple user interface and high-performance source code that is easy to embed and "made in Germany" a 360-degree-object can now be generated and added to any website very easily. If you don't have any image sequences at hand you can download our sample images here. 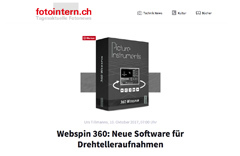 See for yourself how easy 360 Webspin makes it to generate turntable objects and add them to your webpage. 360 Webspin will help you boost your sales! Suitable for touch displays i.e. smartphones and tablets. Works with single- and multi-row image sequences or turntables or other animations like stop motion animations. Easy implementation into CMS systems like Wordpress, Typo3, Joomla or Drupal. 360 Webspin - better presentations made easy.